Betty Sharp, right, works with Sara Charles, left, on one of many art projects at Living Arts Studio in Maplewood. 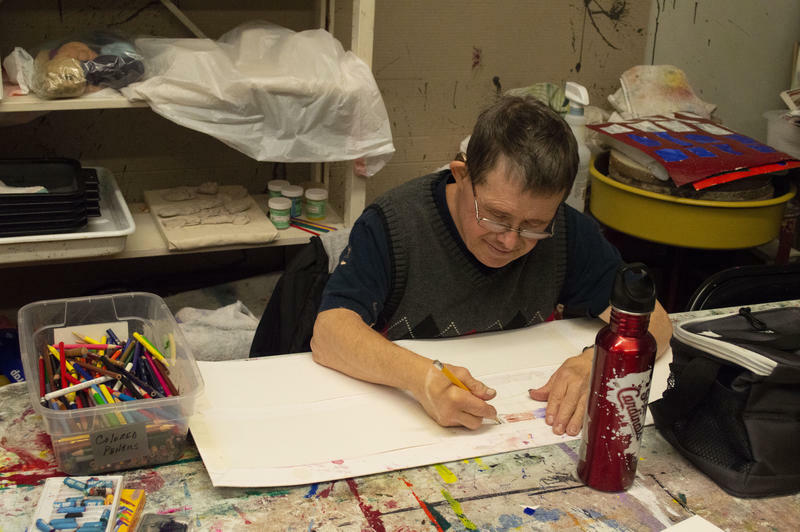 Michael Wiedle and Pauline McDonald work on their latest art projects. 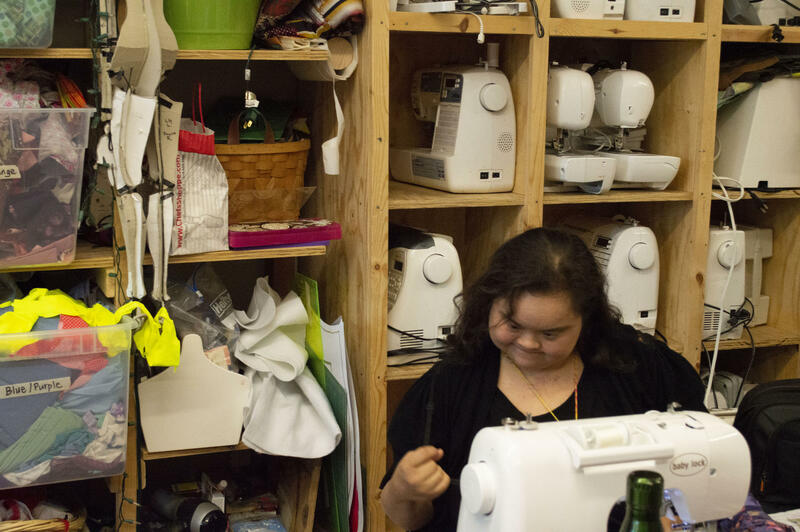 Designer Melelani Perry sews a fashion design she's been working on at Living Arts Studio. Artist Jenn Fryman speaks with Kelly Larson, the creative director for Living Arts Studio. Artist Jim Santen begins one of several drawings at Living Arts Studio. 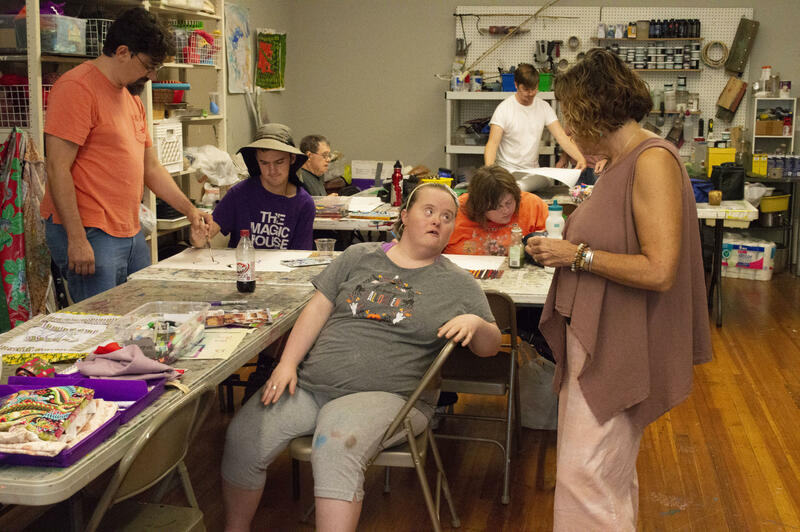 The Living Arts Studio in Maplewood has become the default location for many budding artists in the St. Louis area. 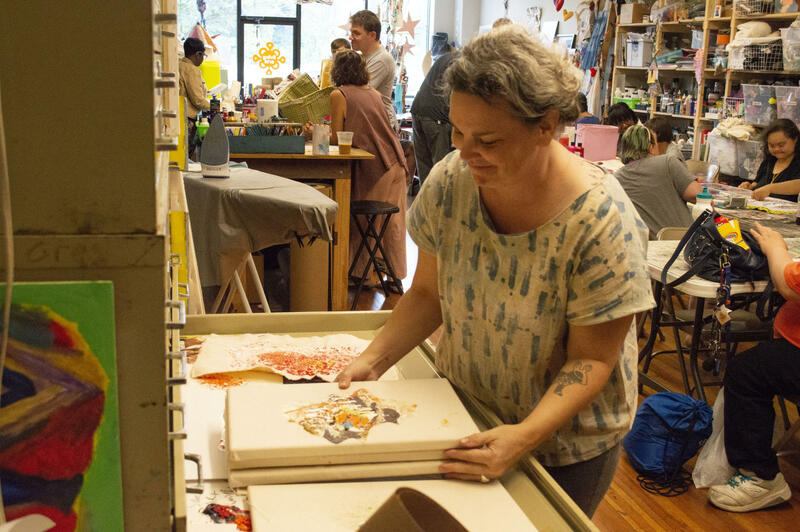 Artists often meet at the studio to work on projects that will be sold and displayed at galleries around the area, including at the St. Louis Art Museum and the University of Missouri — St. Louis. 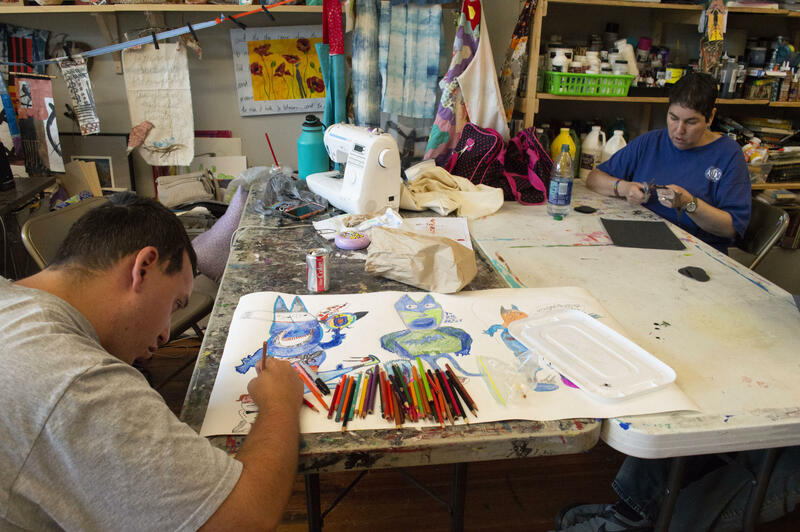 The studio focuses on inclusion, specifically for creative people with disabilities. It is part of VSA Missouri, the state organization that promotes inclusion in the arts. It is also an affiliate of the national John F. Kennedy Center for the Performing Arts. 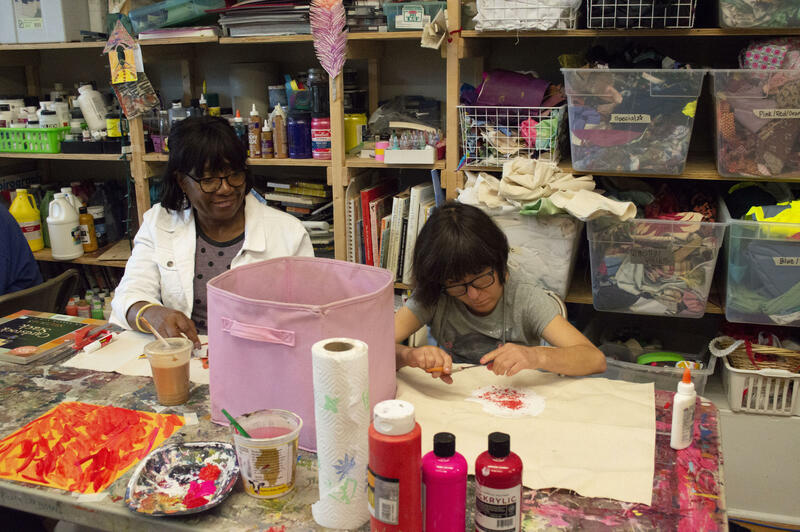 Advocates and artists are working to make sure diversity extends beyond race and gender to include those with disabilities. 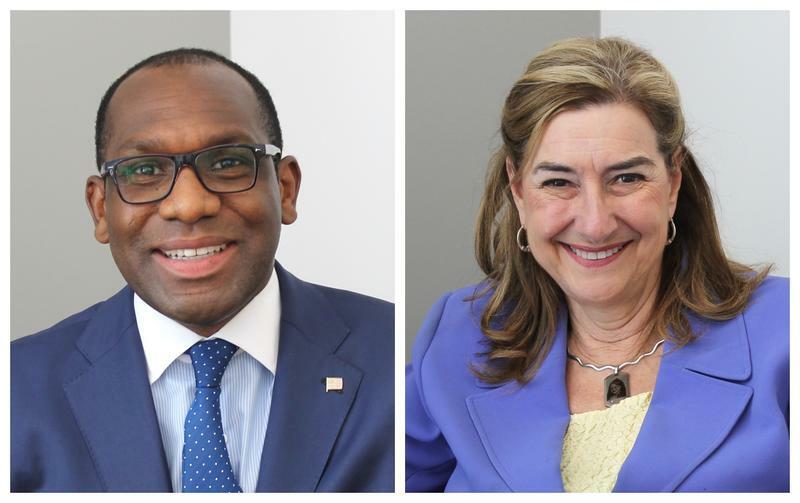 St. Louis Public Radio's Chad Davis reports. Alvarez is proud that the program fosters inclusion and alows the artists to see their work on display while the artists also earn money from their work. She's also worked hard to create connections with arts and entertainment groups to eliminate stigmas associated with disabilities. That work is far from finished. “I have been told by a number of people that I know closely with disabilities that St. Louis isn’t doing as good of a job as it could be,” Alvarez said. Lack of inclusion is not only a St. Louis problem, or one associated only with the creative arts. Statistics indicate it extends into the mass media. A 2017 study by the University of California Annenberg School for Communication and Journalism showed that 2.7 percent of top grossing films in 2016 featured characters with disabilities. Gina Alvarez, the executive director of VSA Arts Missouri, displays artwork from Living Arts Studio member, Sara Charles. Charles has had her work shown several times at community galleries. Now a St. Louis man is hoping to join a small group of inclusive talent agencies by starting his own. Nebula Talent Group began as an idea for Will Bubenik in 2017, with an aim to launch this November. His goal is to create opportunities for actors and athletes with disabilities. Inspiration came from his older siblings. Bubenik is signing clients from the sports and entertainment worlds, including Sean Reyngoudt, a surfer and amputee. Nebula is based in Philadelphia, but Bubenik’s goal is to make sure the agency serves clients around the country. Bubenik says lack of inclusion is only one part of the problem. The other part is making sure the stories of disabled people are not simply fodder for entertainment or prompts for pity. 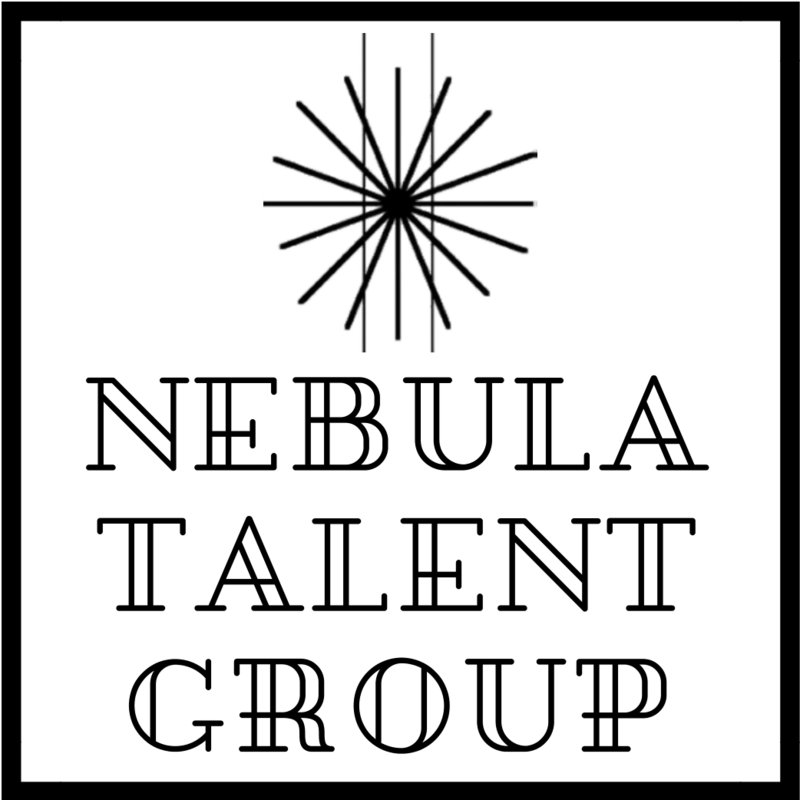 Nebula Talent Group will launch in November. Its founder, Will Bubenik, was inspired by three of his older siblings to create the agency. “Disability has often been perceived as a charity case and not as a bottom line, revenue generating component of an organization,” Bubenik said. Imani Barbarin, the founder of the blog Crutches & Spice, also sees problems with inclusion of people with disabilities as well as portrayals in the media and entertainment. Barbarin, who has cerebral palsy, is frank about the disturbing trend she sees in the portrayal of people with disabilities as well as lack of inclusion. Barbarin started the popular hashtag #distheoscars during the 2018 Academy Awards. The hashtag was made to protest the lack of Oscar nominees and winners who had a disability. A 2016 study by the Ruderman Family Foundation found between 2015 and 2016, only 21 characters on top scripted shows had disabilities. Out of that, only one actor actually had the disability portrayed. Barbarin talked about these issues at length in Bubenik’s podcast, Born To Shine. In particular, they discussed the portrayal of a woman who is deaf in the movie The Shape of Water. The actress who played the lead character is Sally Hawkins, who is not deaf. Actress Marlee Matlin won the Academy Award for best actress in 1986 for "Children of a Lesser God" and to date is the only deaf performer to have won this award. Bubenik began the podcast as a platform for conversations with advocates and professionals who are making a difference in how the arts and entertainment communities address disabilities and people with disabilities. According the U.S. Census Bureau’s American Community Survey for 2016, about 12.8 percent of non-institutionalized persons, male or female — all ages, all races, regardless of ethnicity, with all education levels — reported a disability. Bubenik says that as the population ages, “everyone” will eventually experience a disability. His goal is to make sure efforts to foster diversity in the arts, sports and entertainment don’t exclude people with disabilities. Ava Battelle leans into her camp counselor at the back of a big cafeteria called Miller Hall at Wonderland Camp. Parents, including Ava's mom, are registering their kids for another week there. Ava’s counselor, Sydney Dungan, dangles her arm across the girl’s shoulders. 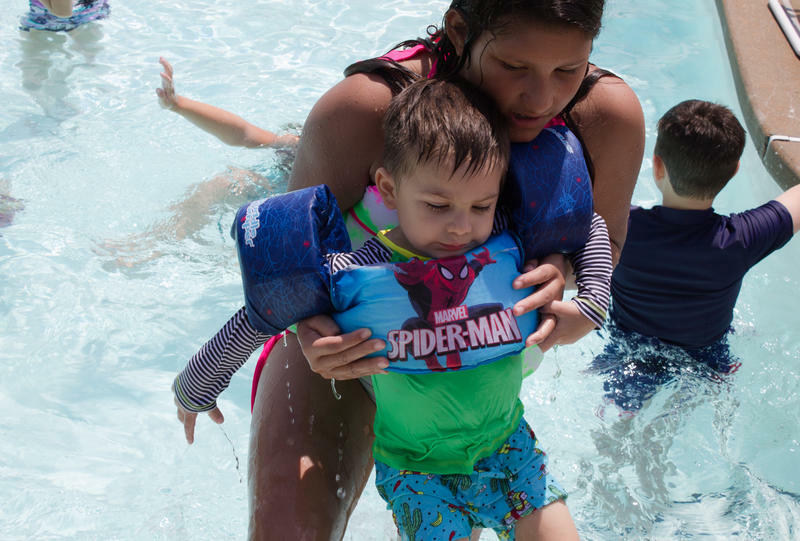 “You don’t get any other experience like this than to live with someone with disabilities for a whole week, getting really close with them, and then just seeing them as a real person and not just as their disability,” Dungan said later. In its efforts to “make the world a better place for disabled people,” the Starkloff Disability Institute is organizing a summer camp designed to inspire high school students with disabilities to explore vast career options, Colleen Starkloff, co-founder of the organization, said. She joined St. Louis on the Air host Don Marsh on Wednesday to talk about the organization’s upcoming program, Dream Big Career Camp. Wade Rakes, chief diversity and inclusion officer at Centene Corporation also joined the conversation to talk about how companies are partnering in the effort. Joan Lipkin has been creating theater with people who have disabilities since 1996, when she co-founded the DisAbility Project. 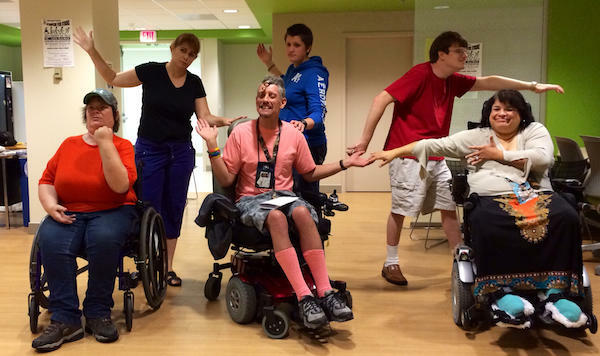 An outgrowth of That Uppity Theatre Company, of which Lipkin is artistic director, the DisAbility Project brings together amateur and professional performers of all abilities to create theater based on lived experience.